The autonomous community consists of a single province (region), unlike most autonomous communities, which have several provinces within the same region. Because of this, the autonomous community and the province are operated as one unit of government. The city of Murcia is the capital of the Region, and seat of government organs, except for the parliament (Regional Assembly), which is in Cartagena. The autonomous community and province is subdivided in municipalities. The Region of Murcia is bordered by Andalucia (provinces of Almeria and Granada); Castilla-La Mancha (province of Albacete), which was historically connected to Murcia until 1833; the Valencian Community (province of Alicante); and the Mediterranean Sea. The highest mountain is Revolcadores (2015 m). The community measures 11,313 km² and has a population of 1.4 million, of whom one-third live in the capital. The region is a major producer of fruits, vegetables, and flowers for Spain and the rest of Europe. Excellent wineries have developed near the towns of Bullas, Yecla, and Jumilla, as well as olive oil near Moratalla. The Murcian littoral, with 170 km, is cliffy and rocky, with some small beaches and sandy coves, where a great variety of ecosystems are gathered: salt marshes, humedals, dunes and beaches. While the rich culture continues to pull visitors back each year, Spain and "Murcia" boast a booming tourist industry and safe social and economic structures. Murcia is rivalling Andalucia. Murcia is one of the Spanish autonomous communities that has grown the most in the last years, and it has conferred it the character of an ideal destination. The Murcia region is little known even within Spain, maybe that's the reason why it continues to be relatively unspoilt compared to other more overcrowded areas of the Spanish Mediterranean coast. 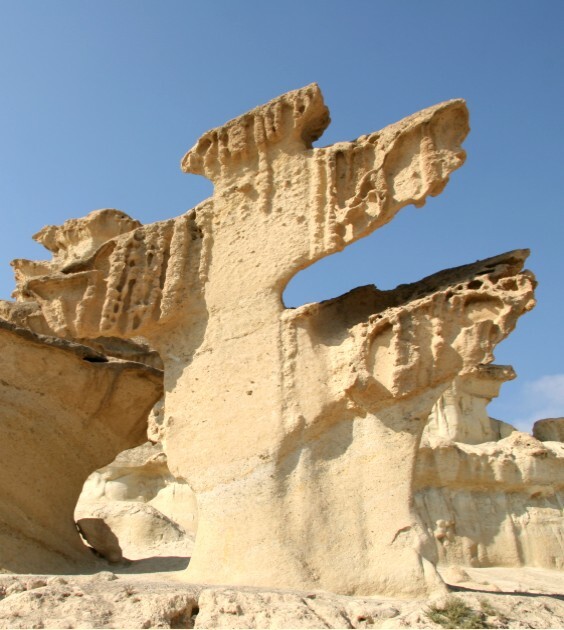 The weather in the Region of Murcia gathers all the common features of a semiarid Mediterranean climate. The annual precipitations are below 350 mm, which vary depending on the area. Therefore, the most mountainous areas act as "climatic islands", reaching the 500 mm. a year. The most humid periods are registered in spring and autumn. Temperatures correspond to the Mediterranean model, with hot summers, when temperatures can overpass the 40º C, and winters are mild and short. The annual average varies between 16º and 19º, depending on the height. There are clear skies during most part of the year and the average insolation is over 2.800 hours a year. The Carthaginians established a permanent trading port on the coast at Cartagena, which the Romans called Carthago Nova. For the Carthaginian traders, the mountainous territory was merely the Iberian hinterland of their seacoast empire. During The Roman period Murcia did not exist but its actual borders could have been inside of the province of Hispania Carthaginensis. Under the Moors, who introduced the large-scale irrigation on which Murcian agriculture depends, the province was known as Todmir; it included, according to Idrisi, the 11th century Arab cartographer based in Sicily, the cities of Orihuela, Lorca, Mula and Chinchilla, Spain. The Kingdom of Murcia became independent as a taifa centered on the Moorish city of Murcia after the fall of the Omayyad Caliphate of Codoba (11th century). Moorish Taifa of Murcia included Albacete and part of Almeria as well. After the battle of Sagrajas in 1086 the Almoravid dynasty swallowed up the taifas and reunited Islamic Spain. Ferdinand III of Castile received the submission of the Moorish king of Murcia in 1243. In the usual way, the Muslims were evicted from the cities, and Ferdinand's heir Alfonso X of Castile, who benefited from rule over a largely depopulated Murcia, divided the border kingdom in three regions for administrative purposes, entrusted respectively to the concejos de realengo, to the ecclesiastical señores seculares, as a reward for their contributions to the Reconquista and to the Military Orders founded in the 11th century. Alfonso annexed the Taifa of Murcia as King of Murcia and Señorio de Cartagena outright in 1266, and it remained technically a vassal kingdom of Spain until the reforms in the liberal constitution of 1812. 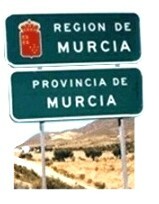 Murcia became an autonomous region in 1982. The Castilian conquest of Murcia was significant because it gave the former access to the Mediterranean for the first time and ended the expansion of the Kingdom of Aragon which had been moving south along the coast. Mazarron - Costa Calida : welcome to paradise. The bay of Mazarrón is a gulf (from Cabo Tiñoso to Cabo Cope). A coastline that is rich in diversity, where you can find abounding breathtaking forms of excavations or erosions (Bolnuevo), but also deposits, hence carving out almost 40 beaches. If to this we add the annual average temperature of 18°C and annual average of more than 300 sunny days a year, we can appreciate that Bay of Mazarrón is a real paradise. Mazarrón (town and Port) is located in the south-east of Spain, in the Region of Murcia and next to the Mediterranean Sea. Mazarrón covers 318 km² and has 35.000 inhabitants. Mazarron offers visitors a rich artistic heritage and interesting leisure activities by the seashore. A fishing port, two marinas and more than 35 km of beaches, virgin sandy coves and rocky bottoms, which constitute an ideal place to rest in the sun, practise nautical sports and scuba diving, as well as taste the local gastronomy. The fishing port and the fish market help to better value the local and the traditional kitchen. 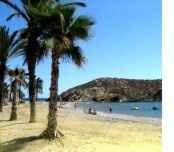 In Mazarron you can find sea, mountain, countryside, a past of sailors, a present of farmers and a future of tourists. Micro-Climate : Temperatures in winter range from 15ºC and 20ºC, and the skies are normally clear, bringing about 2800 hours of sun. There are two reasons to explain the special microclimate in Mazarrón. On the one hand, the town is surrounded by high mountains, stopping the north winds from penetrating in the area. The average temperature is 18º. On the other hand, (in the sea), the location of the Gulf between Cabo de Palos and Cabo de Gata, allows the cold currents that enter the Atlantic Sea through the Strait of Gibraltar to pass without affecting the water temperature, overpassing 5 degrees, if we compare it with the Mediterranean Sea. 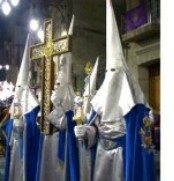 Festivals : The Milagro Festivals (celebrated in Bolnuevo and Mazarrón). The sunday preceding the 17th november the Patron, "La Purísima", is carried from Bolnuevo to Mazarrón, and on the sunday following the 17th november, it is taken down, leading a procession, to the "Ermita de Bolnuevo". It is during this week when that many events are celebrated, like the floral offer to the Virgin, processions and religious activities. On the "Romería" Sunday are held Moors and Christians parades, commemorating the Moorish invasion in our coast (which was the reason why the Virgin miraculously interceded, expelling the Argelines from our coast, the night of the 17th november, 1585). The "Fiestas Patronales" are celebrated on the 19th march, the Saint Jose's Day (during the week before, they celebrate open-air dances, sports activities, a "Falla" monumental is set in the Port Beach with figures that criticize all the events which occurred during the year, and a race of torches). On the 16th july, they celebrate the festivity of the "Virgen del Carmen" with a Mass at the Fish Market, a religious procession, carrying the Virgin by sea and land, in which dozens of boats participate, decorated with multicoloured flags. The monuments : The majority of the monuments are found in the town. Among these monuments, we can highlight the Town Hall « Ayuntamiento », dating back to the XIX century and an artistic-historic national monument, as well as the church of "San Andrés" or "la Torre de Santa Elena". There are also other monuments, which have been declared as the Heritage of Cultural Interest : "la Torre de Santa Isabel", "la Torre de los Caballos", "el Castillo de Los Vélez" and "el Molinete". For old castle and/or military forts lovers, taking the old road (carretera) between Mazarron and Cartagena, on the right side (after you go into the mountains) you will find a road to the Mazarron old fort. This military fort was built, improved and used by military forces (artillery) during Franco's leadership. Here you will find very big cannons and you can visit the fort. In its waters, you can find the most important ecosystems of the Mediterranean, the land of Poseidon ( Posidonia oceanica ). It possesses important marine vegetation where you can find sea basses, lobsters, conger eels, dolphins, whales, octopus and morays. The diving center of Mazarron is a sport club for underwater activities. Diving takes place particularly in the Mazarron sea bay, in the area of cape Tiñoso and the Cueva de Lobos (cave of the wolves). The water offers the chance to practise canoeing, sailing, windsurfing, driving and ski-jet riding. Once on land, you can take the routes on bicycles, motorbikes, horse-riding and hiking. In addition, if you would like to keep your feet above ground, you could just do hang-gliding or zip-wiring. The orchard and sea products are the basis of Mazarrón's gastronomy, in which we can highlight dishes such as rice with lobster or special cooked tomatoes dishes. The sea bass cooked Mazarrón style, "Migas", milt cooked open, salted fish, and noodles with "bonito" are some of local fish used in the Mazarrón's gastronomy. This area is marked by its contrasts : the mountains, the fertile farmland and the Mediterranean sea. There are abounding beautiful coves and spots (places) along its coasts where those who choose Camposol can enjoy all types of activities. In Camposol, it is provided with an 18-hole golf course, a four star Sensol Resort and Hotel : Resort of thermal waters with 25 treatment boxes. Tropical Pools and Spa. Golf Club House. Tennis courts. Bowling Alley, restaurants, bars, Traditional English Butchers selling fresh local meat, sausages, pies and selection of frozen products. Sensol Hotel with golf course in Camposol. The Sensol Hotel is a modern and complete establishment, ideal to spend the holidays or for the business trips, or even to hold congresses and events. Located in Camposol - Mazarron, ( Murcia ), the Sensol Hotel offers modern and luxurious facilities. Its 164 rooms are totally equipped, stylishly decorated. From its windows and terraces, you could enjoy beautiful views over the Sensol hotel golf course with 18 holes. An ideal place to practice this relaxing sport. Swimming pool, tennis and paddle course complete the sport offer of the Sensol Hotel. The Sensol Hotel has an excellent restaurant and a complete Business Centre, ideal to celebrate any kinds of events, conventions and incentives. Nothing could be better than enjoying the sport relaxing you in its Spa zone with sauna, jacuzzi, Turkish Baths or do you prefer anti-stress therapies and beauty treatment ?